Self-acceptance is fundamental to any healing or change we want to make in our lives. Nothing takes our energy, spirit, and authenticity away more than a lack of self-acceptance. If you want success and abundance, self-acceptance is critical. 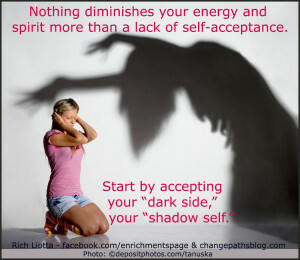 In this article the importance of accepting your “dark side” or “shadow self” will be addressed. There are several steps that can be made toward greater self-acceptance. This is the first of a series of articles to help you on your journey toward self-acceptance. We all have a dark side. This includes our negative qualities that we do not want to accept. It can also include memories about “bad” things we have done which we feel signify something negative about who we are. Carl Jung, a famous Swiss psychiatrist, referred to this part of our selves as the “shadow.” (Further reading to consider: Stephen A. Diamond, Ph.D. discusses Jung’s concept of the shadow self in depth here.) Jung assumed that this part of our selves is unconscious, kept outside of awareness because accepting these parts of ourselves would be too threating to our ego or our sense of self. In my experience as a psychologist, people are often quite aware of their dark side, including their negative qualities and memories that produce shame and guilt. If repressed they are usually not far below the surface when encouraged to reflect on them nonjudgmentally. Yet people often avoid such awareness, as embracing that acknowledgement somehow makes them a bad person. In reality it merely makes them human. Though what comprises people’s dark side varies, it often includes qualities such as greed, vanity, jealousy, selfishness, undesirable sexual feelings, desires for immediate gratification, needs for power and control, apathy, pettiness, and anger – to name a few. Your dark side may also include regrets, shame, and guilt, over mistakes you made in the past. The things you have done when the negative qualities drove your decision making and behavior. Acceptance of these or other aspects of your self can be difficult – if they do not reflect who you want to be now. But they are a part of you nonetheless, and they are not all of who you are. It is highly valuable for your personal development, growth, and progress in life to find a way to accept your dark side and your demons. For one thing, and perhaps most importantly, accepting that you have some qualities that you don’t like takes their potency away. Saying to yourself, for example, “I can be a selfish and angry jerk” shines a light on the darkness. Now I have a choice. I can choose my generous and compassionate aspects instead. You have options when you accept your negative qualities. The danger is not in acknowledging them; it is in denying them or failing to be aware of them. It is when they are buried that they can wield their power. The same is true for memories that you feel reflect badly on you as a person. Whatever you did was a choice you made in a particular time and place in your past. It likely says less than you feel it does about who you really are now. Your ability to be how you want to be is only in the present and the future. If you can accept your dark side, you have taken a giant step toward self-acceptance. It can be scary to acknowledge the negative. Having negative aspects does not make you a lesser person. We all have our issues. Reflect on your dark side with a nonjudgmental attitude. We all have positive and negative aspects of ourselves. To accept your dark side or shadow it is helpful to ask yourself several questions and to reflect upon these points. First, ask yourself if a quality you see as part of your dark side is really that bad, or if you have taken to heart the judgment of others? Many of us were chastised when we were young for things that are quite normal. Are you having trouble accepting some aspect of yourself because you were given the message that you should not accept that part of you? Second, know that you choose your actions. Just because you have feelings at times, such as greed and selfishness, it is not horrible. They are feelings and thoughts people have, just feelings and thoughts. They often come in a flash and pass just as quickly. It is what you do in your actions that ultimately matters. By examining the negative qualities you have in this light, you will see they are small in comparison to your positive qualities. Third, know everyone makes mistakes. Most, if not all of us, have done something at one time or another that was encouraged by our dark side, and we feel bad about it. Most often there is little we can do now to “fix” the mistake or thing we did that we regret. What matters now is that you have learned from the experience. You can make choices consistent with who you want to be from now on. Ask yourself “What wisdom have I gained from my mistakes and expressions of my darker side?” You may find it much easier to accept your shadow self from that perspective. Finally, what does your dark side have to offer that helps you? Even negative qualities have their positive aspect. Often a negative quality channeled correctly can be an asset. Anger, for example, can provide energy toward making positive change in your life. How you interpret the meaning of the quality matters. Perhaps your jealousy and envy can be seen as part of your creative imagination. Channel that quality, your creative imagination differently, and it can become something positive! The challenge in moving toward self-acceptance is acknowledging your dark side or shadow self and then integrating this into your present and future sense of self. This self-acceptance frees you to be who you are. This can unleash creativity and allow an abundant mindset. As you journey on the path toward self-acceptance, you will, at your own pace, learn to accept all of you. Look for more articles here on the topic of self-acceptance in the near future. This entry was posted in Abundance, Authenticity, Self-Acceptance and tagged abundance, personal growth, self-acceptance, self-discovery, self-improvement. Bookmark the permalink.